This is a yummy soup served chilled or warm in the winter. On this occasion I used 6 peeled English cucumbers, 2 bunches of mint and 2 sautéed red onions. I used 2 Telmas Tock cubes with 2 cups of water. I sautéed the onions and poured that along with the stock into the blender with the cucumbers and mint. I blended and put in the fridge. I added ice cubes before serving. This watered the soup down further. The cucumber is very watery so there is no need to add a lot of water/ stock to this soup. This is my favorite winter soup. The parsnip is so nutty and creamy and delicious. I always strive to make a soup without cream. To me this is the yummiest of the cream-less soups. On this occasion, I served my guests just one shot of soup (in a tall hand-blown Mexican tequila shot-glass) to warm them up when they came in. It did indeed warm the tummy and left the guests wanting more. Remove the ends of the leeks. Slice in half and wash out any soil still inside of the leek. Slice each half and sauté in large pot, with extra virgin olive oil, cracked black pepper, finely ground white pepper, and pearl onions. Leeks cook very quickly. Once almost transparent, add washed parsley in a cup and use kitchen scissors to cut up into very fine pieces. 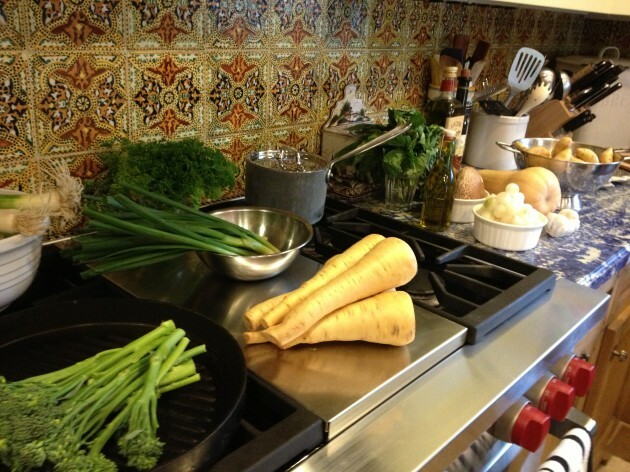 Slice the parsnip and add to the sauté mix, with parsley and the sliced green onions. Add stock. Cook for 3 minutes on high. Add to the blender and liquefy. Return the soup mix to the pot, heat, and serve. If there is a ton left over, place in glass jars for the next day. I never make soup for only one serving. It is so easy to freeze and tastes even better the next day.